Students learn about the remote sensing radio occultation technique and how engineers use it with GPS satellites to monitor and study the Earth's atmospheric activity. Students may be familiar with some everyday uses of GPS, but not as familiar with how GPS technology contributes to our ongoing need for great amounts of ever-changing global atmospheric data for accurate weather forecasting, storm tracking and climate change monitoring. GPS occultations are when GPS signals sent from one satellite to another are altered (delayed, refracted) by the atmosphere passed though, such that they can be analyzed to remotely learn about the planet's atmospheric conditions. Engineers and scientists use GPS satellites and low-Earth orbit (LEO) satellites to study the atmosphere of Earth, which provides information that is helpful in the analysis of weather, climate, pollution, ozone and solar radiation. Although GPS satellites designed by engineers are most commonly used for navigation, a technique called GPS occultations is now extensively used gather atmospheric data from all over the planet. Using satellite information gathered via this technique enables us to learn more about our weather and climate and how the atmospheric layers function and interact with one another. What do we use GPS satellites for? (Expect answers that deal with land, sea and air navigation.) Besides these, have you heard of any other uses for GPS? The global positioning system (GPS) was originally created by engineers for military use, but today, most people use it to help them find out where they are so that GPS receivers can direct them to desired locations. However, GPS is also used for land surveying, farming, fishing, tracking plate tectonics, time keeping, and atmospheric studies. Today, we will focus on how to use GPS signals to study our atmosphere. Recall that as the Earth's atmosphere stretches from the ground up towards outer space, it is composed of many layers. How do we study our atmosphere? (Possible answers: Radar, weather stations, weather balloons, thermometers, barometers, satellites.) How do we use satellites to study our atmosphere? Well, satellites take images of our planet from which we get information about wind currents, smoke, clouds and storms, and other activity. We can also use signal analysis techniques, such as occultations, to send signals through the atmosphere and gain information by examining the different effects the atmosphere had on the signals. Without satellites, if you want to be able to study weather and climate around the globe, you would need to have people and equipment at every location. Fortunately, satellites in various orbits around the Earth pass over all sorts of locations so we can gather information from those regions without having to send people or build weather stations in those areas. Even though designing, building and launching satellites are expensive, in the long term, they are less-expensive than the costs to position equipment and staff to acquire data from thousands of locations over the course of every day (see Figure 1). Unlike weather balloons and land-based data stations, the signals can penetrate clouds, portray multiple layers of the atmosphere and fill in the data gap over the oceans. Figure 1. A typical example of the great amount of GPS occultation system data received in one day. 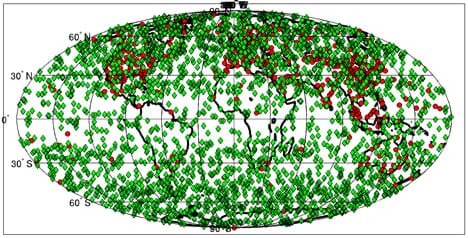 Compare the amount of data from COSMIC GPS occultation locations (green diamonds) to that from weather balloons (red dots). A technique called radio occultation is used with satellites to provide information about our atmosphere. For several decades, radio occultations have been used as a remote sensing technique. In fact, they were first used in interplanetary spacecraft to gather information about other planets in our solar system. Remote sensing describes any way of making measurements or receiving information about objects, phenomena or locations, without making physical contact with the targets. More than 10 years ago, scientists and engineers started using GPS signals to study our planet's atmosphere using a new science called GPS occultations . This technology provides the opportunity to mitigate natural hazards by providing temporally and spatially detailed data on storms, such as Hurricane Sandy – a hurricane in 2012 that was the second-costliest hurricane in United States history. [Show this video from UCAR of 2012 "Super Storm" Sandy (http://www.cosmic.ucar.edu/movies/sandy_cII.mov) to the class and ask the following questions]. What is this animation showing? [Answer: This is comparing data from different points between COSMIC (GPS) and NCEP along Sandy's path up the eastern US. It is important to explain to the class that NCEP data is data smoothed from ground observations.] What do you notice about COSMIC data versus NCEP? [Answer: They compare very well! This means that COSMIC data is providing accurate measurements that are consistent with other sources of atmospheric data.] Figure 2 shows actual atmospheric data (e.g. temperature and water vapor pressure) received from COSMIC. Figure 2. Temperature and water vapor pressure for various atmospheric depths at a given point during a given time. Radio occultation is a remote sensing technique used to measure the physical properties of a planet's atmosphere. It relies on the detection of a change in a radio signal (such as refraction/bending) as it passes through the planet's atmosphere (as it is occulted by the atmosphere). Using GPS satellites to perform radio occultations is known as GPS occultations, and is a technique first applied in the mid-1990s for performing atmospheric measurements. An occultation event occurs when a GPS signal passes through the atmosphere and is received by a low-Earth orbit (LEO) satellite. As the signal passes through the atmosphere, it might be disturbed by events such as weather (temperature, humidity, water vapor concentration), causing the signal itself to be delayed and bent (refracted). By analyzing the received signal, an almost instantaneous depiction of the atmospheric state (the type of disturbances) can be determined, as well as its location. The technique provides information about activity taking place in the atmosphere between the GPS satellite and the receiver acquiring the GPS signal. Typically, the receiving satellite is in a low-Earth orbit. For example, the COSMIC satellite constellation managed by the University Corporation for Atmospheric Research (UCAR) is a group of six satellites orbiting ~800 km above the Earth that receive and analyze GPS signals for occultation research. COSMIC stands for "constellation observing system for meteorology, ionosphere and climate." So, the occultation technique uses satellites orbiting a few hundred kilometers above us in combination with GPS satellites, which are 20,000 km above us (more than one and a half times the diameter of Earth! ), to study what is going on in the air right above us. Figure 3. Progression of a GPS occultation. 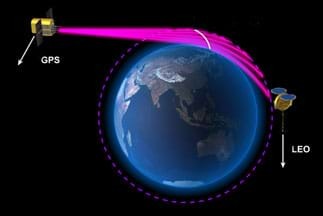 GPS signals pass through the atmosphere, are delayed and distorted due to gravity and atmospheric conditions, and are received by low-Earth orbit (LEO) satellites. Analysis of the received signal conveys the atmospheric state and location. 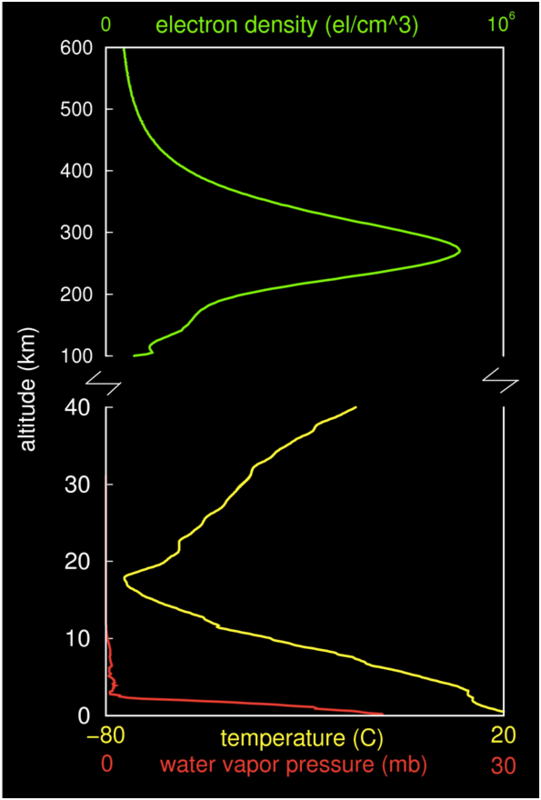 When a GPS signal passes through the atmosphere, it bends because of gravity and from refraction by more "turbulent" particles in the atmosphere not present in outer space (as shown in Figure 3). The more bending that takes place in a signal path signifies greater disturbance due to weather or other phenomena in the ionosphere or solar/magnetic activity. Generally, the lower a signal passes in our atmosphere, the greater the bending as the atmosphere is more pronounced closer to the ground than closer to outer space. These disturbances can distort the signal, scrambling the information received at the LEO satellite. Additionally, the more bending that takes places upon a signal, the longer its path to the receiver, meaning the message has been delayed and is received later than if it had travelled a straighter path. Engineers analyze the signal delays and message distortions to determine the types of disturbances that took place along the signal paths. They also use satellite geometry, timing and other advanced techniques to localize the disturbing phenomenon by longitude, latitude and altitude. Because the relative position between the sending and receiving satellites changes over time, this technique allows for vertical scanning of successive layers of the atmosphere, making it helpful for weather forecasting tools and monitoring climate change. Systems like COSMIC can boost the accuracy of forecasts of hurricane behavior, significantly improve long-range weather forecasts, and monitor climate change with unprecedented accuracy. GPS occultations are advantageous because they provide data from all over the globe. Because satellites are orbiting Earth, the various satellite positions allow for occultation event data to be obtained everywhere. Currently, COSMIC is able to obtain more than 2,000+ unique occultation events per day (see Figure 1). Each event lasts from a few seconds to a few minutes, but in this short time, much information is learned about what was going on in the atmosphere where the event took place. In contrast, to do this from the ground would require so many ground stations and staff to manage the equipment and data, which would add up to be very costly over time. Satellites are expensive to build and launch, but once in orbit, Earth's gravity keeps them in place and, in most cases, only small adjustments are needed to preserve the orbit integrity. COSMIC: Acronym for constellation observing system for meteorology, ionosphere and climate. Six satellites orbiting Earth that collect information that helps researchers advance our knowledge of the Earth's atmosphere. GPS: Acronym for global positioning system. A satellite constellation consisting of a minimum of 24 satellites orbiting Earth at altitudes of 20,000 km. They are commonly used by citizens for navigation purposes. GPS radio occultation: An event in which a GPS signal is bent as it passes through the Earth's atmosphere and is received by a LEO satellite. An occultation typically lasts from seconds to a few minutes. Analysis of the received signal indicates the atmospheric state passed through. interplanetary spacecraft: A spacecraft launched out of the Earth's gravity field in order to travel to other planets to complete its mission. ionosphere: Part of the Earth's upper atmosphere (80km–400km) consisting of several ionized layers due to solar radiation. occultation: An event in which a GPS signal is bent as it passes through the Earth's atmosphere and is received by a LEO satellite. More generally: The act of blocking or hiding from view, as in an eclipse. radio occultation: A remote sensing technique used to measure the physical properties of a planet's atmosphere. It relies on the detection of a change in a radio signal as it passes through the planet's atmosphere (as it is occulted by the atmosphere). For example, when electromagnetic radiation passes through the atmosphere, it is refracted. remote sensing: Any way of making measurements or receiving information about objects, phenomena or locations, without making physical contact with the targets. tomography: Imaging by sections using a penetrating wave (signal). For example, if you used sonar to take data of what is straight ahead of you (two dimensional) while moving to your side a few inches between measurements (sectioning), you can combine the measurements to form a three-dimensional model of what was in front of you as you moved sideways from your start to end point. Distorted Disturbances - Students pass around and distort messages written on index cards to learn how we use signals from GPS occultations to study the Earth's atmosphere. The cards represent information sent from GPS satellites being distorted as they pass through different atmospheric conditions and reach other satellites. Lesson Summary Worksheet: Have students complete the GPS Occultations Worksheet , which includes nine fill-in-the-blank sentences and a word search puzzle. Review their answers to gauge their comprehension of the lesson content.